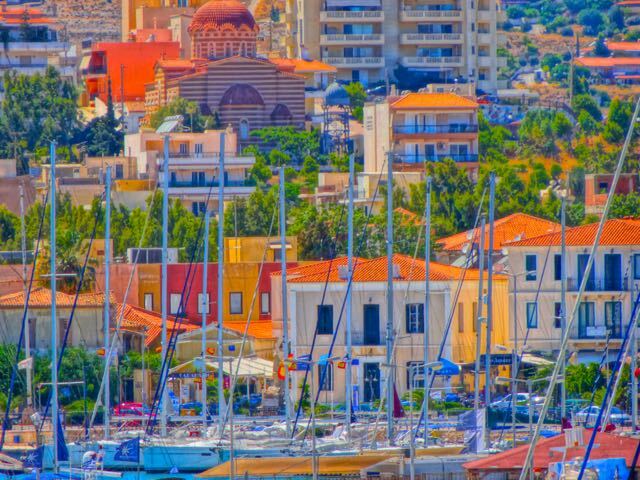 No longer a place to be avoided, the port of Lavrion is changing faster than any town in Greece, opening tavernas, mezedopouleions, cafes and shops while becoming an important ferry boat hub for the Cyclades Islands and home port for several cruise ships and sailboat companies. The town of Lavrion on the tip of the Attiki Peninsula is not featured prominently in very many guidebooks about Greece even though it has the oldest and biggest ancient amphitheater in the country and a mysterious giant hole that would be an attraction to Fortians and seekers of unexplained phenomena if they knew about it. The area is known for its industry and mining operations from ancient times. This is where the giant columns from the temple of Posideon at nearby Sounion were dug out. The Silver mines date back to prehistoric times. The washeries where the silver was extracted are still visible and currently in a state of being restored. These mining facilities are believed to be the oldest in the world! The Lavrion Silver mines financed the fleet with which the ancient Athenians defeated the Persians, and financed the building of the Acropolis and other monuments of the Golden Age of Athens. Later the mines got much more industrialized, and covered the entire region with melting pots and tunnels as well as some of the bi-products of mining and extracting. One effect of this industrialization was that Lavrion had the first railroad tracks in Greece, and the first proper harbour facility to load ore via a bridge to barges and ships. Another side effect of this mining activity was that many different and unique minerals were discovered. These minerals bring a lot of geological tourism into the mountains and very interesting samples are displayed in the Mineralogical Museum. The Archaeological Museum gives a good picture of the development of the ancient civilization, which was hugely effected by the early industrialization. The tunnels and shafts dug to reach the layers of minerals created heaps of debris near the mine entrances. It is possible, to this day, to find a large variety of minerals quite easily. Despite the highly developed metallurgical techniques in the factories, the remnants of which are very well preserved in Lavrion , the Ancient Greeks could not take out all the silver from the ore and after smelting used to dump the slag into the sea. The sea water, which contained minerals penetrated into the slag for thousands of years and reacted with other trace elements. This chemical reaction resulted in the growth of perfect crystals of various minerals , some of which are very rare and exist only in Lavrion. In the winter, when the heavy seas deposit these crystals on the beaches, many collectors come to Lavrion to find them. Up until a few years ago Lavrion was a pretty dismal place. The unemployment was around 75% and the city was used as a refugee center for Kurds and other people. The physical state of Lavrion was so bad that Greek film director Theo Angelopoulos, used the city as a stand-in for war-torn Sarajevo in his film Ulysses Gaze. 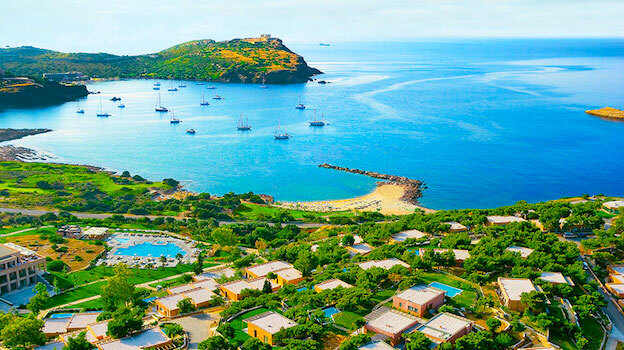 In the last few years Lavrion has gone through an amazing transformation. Restaurants, shops and cafes have opened and Lavrion has new life due to the rebuilding of the port into a major ferry terminal for the Greek islands and the relocation of several sailboat charter companies and a marina. There are two well stocked supermarkets at the top of the town's central square, which is more like an extended rectangle with fountains and cafes and restaurants as well as a couple excellent bakeries. On Thursday Lavrion has a fantastic Laiki Agora (farmer's market). They also have a mineral museum with 700 samples of 115 different kinds of minerals, some very rare. Unfortunately it is only open from 10am to noon and their website is still under construction. Lavrion's fish market was one of the best in Attika being supplied by the town's fishing fleet. The nearby waters of Evia are rich in sardines and anchovies and other healthy fish. Most of the market has been converted into restaurants and ouzeries most specializing in fresh fish. People come from as far as Athens to eat here and those who have to wait a few hours for a ferry boat can do so while drinking ouzo and eating fried fresh shrimp, grilled sardines, friend gavros (anchovies), fried and grilled fresh squid, and barbounia (red mullet). I recommend the first place, the ouzerie-mezedopoulion right across from the last of the fish shops. This place can get very festive, especially on a summer weekend. It is mostly mezedes and since you are right in the fish market whatever you get will probably be fresh. If you want a full fish meal I recommend Olga's which is just across the way. 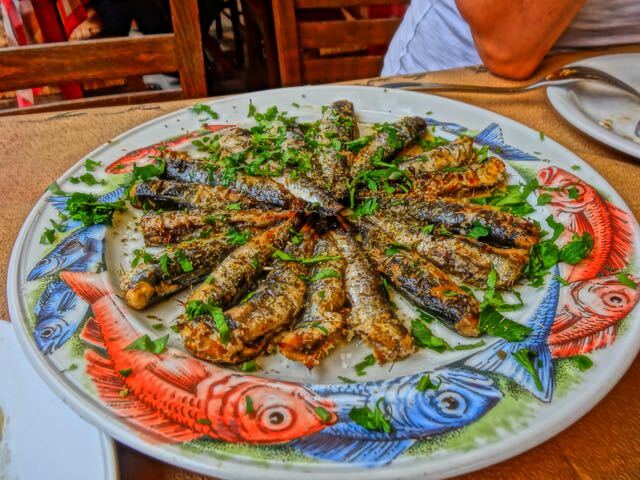 Go for the grilled fresh kalamari and the Olga special salad and of course you have to get the fresh grilled sardines which are a summer staple for my family. If you crave Italian food Da Vittorio Restaurant on the waterfront serves authentic Italian dishes and is popular with Greeks and travelers. 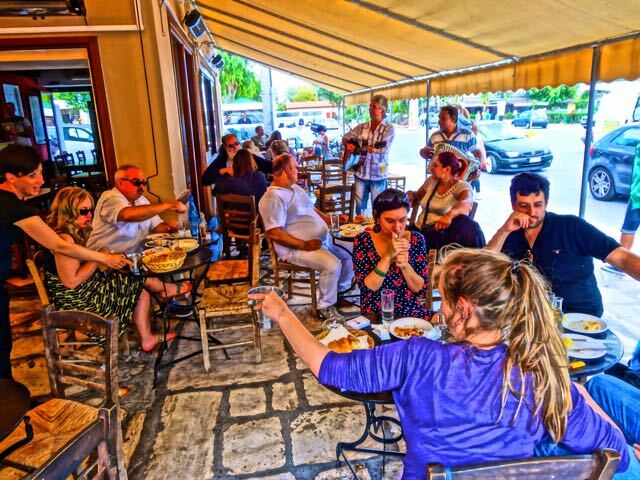 If you crave roast chicken, rotisserie lamb or pork, kokoretsi, kontosouvli or even just a souvlaki or two go to psitopouleio To Perasma a typical Greek grill house, which is right on the long square by the fountains. They have tables on the square too. Before you leave the area go next door and try the cheese-bread at the Ipirus Bakery, and if you are on a cruise or going to the islands get a kilo of their home-made granola bars. I eat them for breakfast every day for as long as they last when I stop here on the way to Kea. The coolest place in town would have to be Berntes Cafeneion at 40 Elia Menti Street which is the service road parallel to the Lavrio-Sounion road on the way out of town. Owned by the charismatic Soulis, a seafarer who has planted his roots in Lavrion, they serve excellent mezedes and have live rembetika music on weekends. 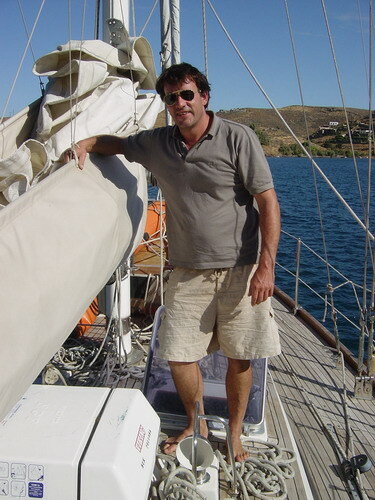 Speaking of Soulis, his former boss, one of the sailboat skippers who lives in Lavrion, is my friend Stefan Ritscher who sent me the following review his favorite restaurants. "There are several places from fast food to good standards all around the main square (Plateia Heroon). Special attention deserves the Avli Taverna, located directly at the bus stop from Athens, conveniently between the main square and the port. The Avli is a rather modern style and very clean place that offers traditional Greek dishes as well as a variety of international plates, prepared and offered in a nice style with decent prices. Further it offers the biggest variation of beers in the entire area. In a separate facility it offers some entertainment and has a bar-style. Another very good place of interest is the 'Kokovios', located next to the National Bank, nearby the Plateia. It offers very good food to reasonable prices in a traditional and very clean facility. Nightlife is abundant around the port, even though the prices are made for the Athens/Sounion visitors. Several very nice tavernas and restaurants are found just out of Lavrion, like the 'Faros' on the road to the Sounion temple near ' Passa Limani ~ 5Km). It is especially known for its variation of Greek starters (Meze), offers a very warm atmosphere and is decent priced." "The history of the big hole is not entirely cleared yet (not many people are working on a clarification anyway), but the most reliable is the one of the ancient Meteorite, which would explain as well, why there are so many minerals around that area, that attract large numbers of collectors and geologists every year. Through the heat occurring at the impact of that celestial rock, stones around the area got molten, and these minerals formed. Another theory claims, that these minerals were there anyway, since the entire area always held minerals of all kinds, and it was just by chance that around the hole is a concentration of them. The hole itself got rather created when a cave or the cover of a lake under the surface collapsed. I am not a Geologist, but I don't like this theory, since there is no water held at all inside the hole, even though it is some 200' deep, and normal caves are located on the foot of a hill, and not right at the top, -but I may be mistaken. A 3rd one, which is rather Gossip, says that the hole got dug out by men on search for valuable minerals, since the companies next door were all just searching for silver and lead, and had their very own structure of tunneling the area." 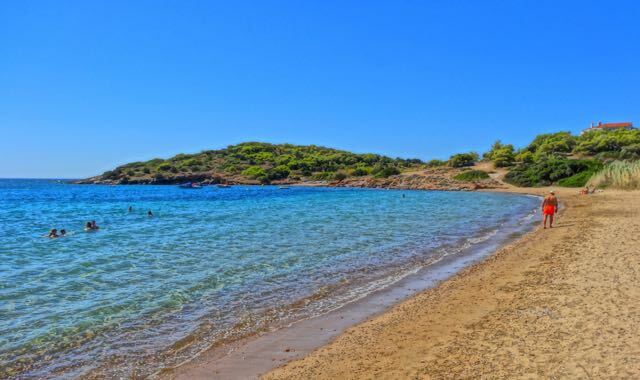 There are several small beaches just off the road that leads from Lavrion to Sounion that are about as close as you can come to being on a Greek island without getting on a ferry boat. The best of them, in my opinion is Asimakis Beach, which has an excellent family owned fish taverna of the same name right on the sea surrounded by beautiful gardens. It is across from the Hotel Saron and there is a giant sign that is hard to miss. For wind surfers one of the best places in Greece is just to the north of Lavrion. There are a couple small beaches in this area too but none that I would recommend you swim at since they are both in site of what used to be a Dupont chemical plant. The sea on the other side is probably much cleaner. Another nice beach is Passalimani which is a couple kilometers outside of Lavrion and Panormos/Pounta Zesa. These beaches you can find by turning left off the Lavrion-Sounion road and wandering around until you find them. But Asimakis Beach is your best bet, especially since it has the taverna and is easy to find. 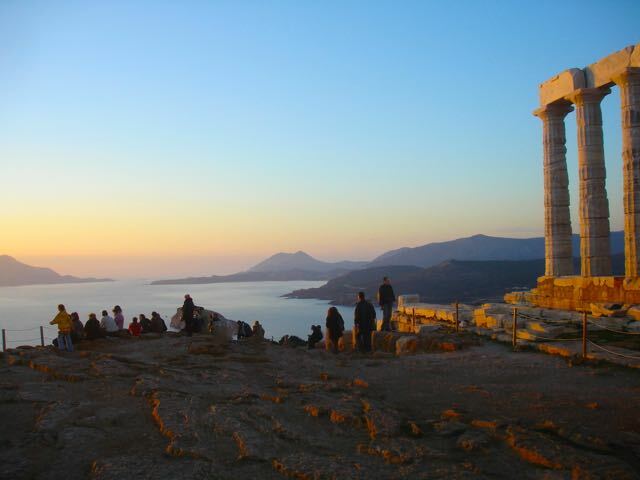 Don't forget to visit the Temple of Poseidon at Sounion which is one of the most important temples in Greece. 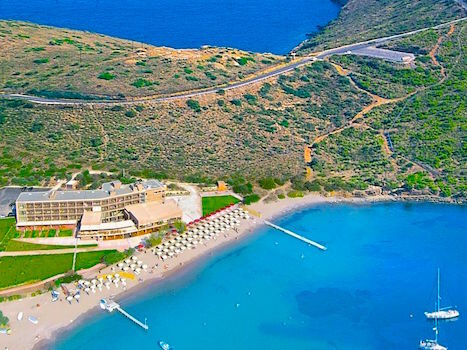 There is a small beach below that sort of belongs to the Aegeon Beach Hotel but since you can't own a beach in Greece, at least not yet, anyone can go there and swim. They may ask you not to use their beach beds though. There are also two fish tavernas right on the beach. Of the two Elias is the better. If you can come during sunset this is the best time, though it is pretty spectacular whenever you come. Most people come here on the Half Day Cape Sounion Afternoon Tour or else with George the Famous Taxi Driver who gives you more freedom to swim, go to a taverna, or explore Lavrion. Across from Lavrion is the former prison island of Makronissos. Visit the nearby island of Kea too, one of the best kept secrets in Greece. 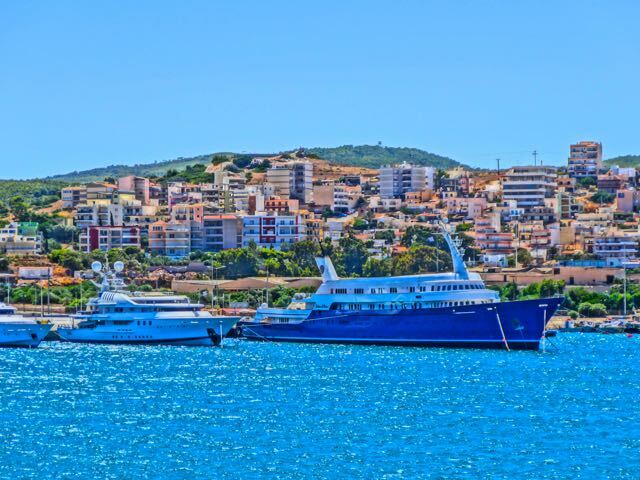 For those of us who live on the island of Kea, the change in Lavrion is amazing since this is where we have to catch the ferry and sometimes, if you are flying from abroad, there may be a lot of time between your flight and your ferry. But Lavrion is no longer a place we don't want to get stuck in. 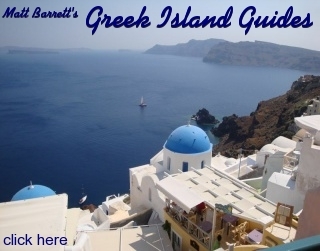 It is now somewhere we can go to visit if we need a break from the island, need to do some shopping, or need a culinary change when we tire of Kea's restaurants. This change in fortunes for Lavrion could not have come at a better time. 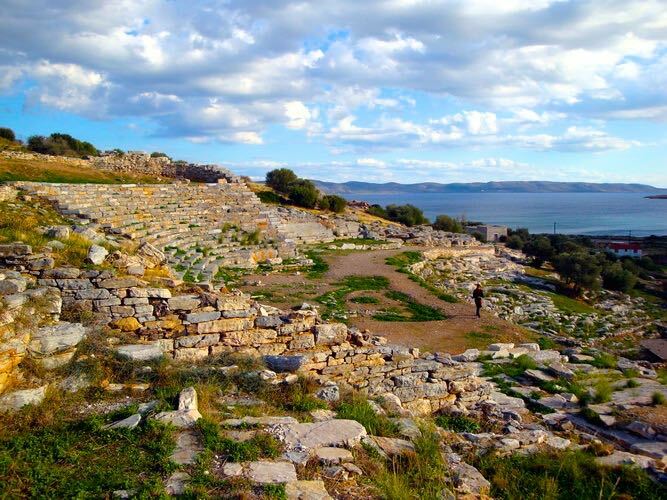 It appears that Lavrion, a city with a glorious past, now has a promising future, something that may have seemed impossible just a few years ago. 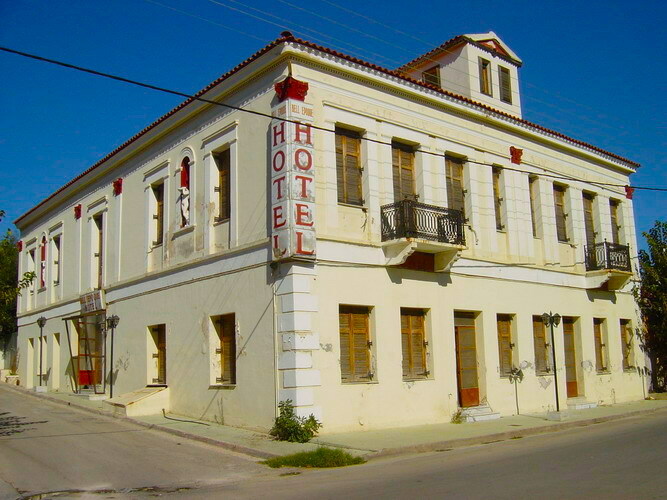 If you love rocks, minerals and crystals or need a good starting point for your trip to the Greek islands, or a seaside taverna on a sunny afternoon, Lavrion is not the scary place it was a few years ago. You can get to Lavrion by Orange KTEL-Attika buses that leave from Green Park (Pedion Areos) where Alexandras Avenue connects with 28 October-Patission Street. They leave every half-hour. You can also catch it at Ethniki Amyna which is a stop on the metro. There is also a bus from the airport. Try to get the bus that gets there in time for the ferry if you are coming here to go to the islands. The port is a long walk from the town and if you have your luggage with you it won't be much fun. The bus that takes the coast road to Sounion leaves every hour and has a bus stop on Fileninon Street right by Syntagma Square. You can connect with the bus from Sounion to Lavrion. With the new ring roads you can now be in Lavrion in under an hour by taxi. You can use George the Famous Taxi Driver or have the concierge at the hotel call one for you. It is best to agree upon a price before you go. If you use George you can go to the beach or go to a taverna if you have time before your ferry. You can catch the ferry to Kea which leaves several times a day from Lavrion. There are also boats to Kythnos and Lemnos several times a week. 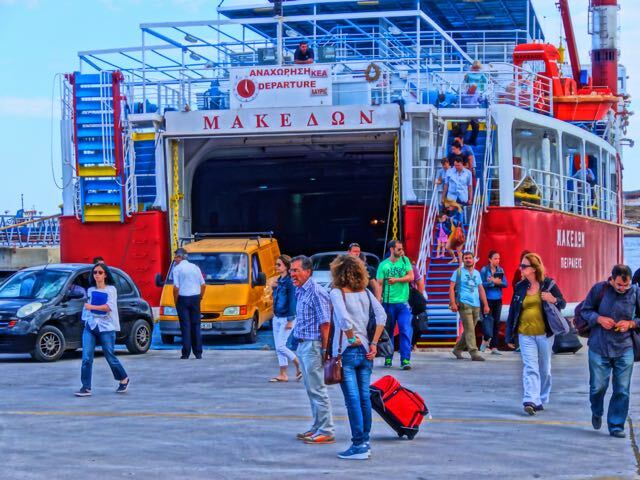 Two or three times a week the NEL ferries stop in Lavrion during its trip around the Cyclades.